I once stood on top of a hillfort in Hampshire, not on the Wessex stretch of the Ridgeway but in sight of it, and asked him how the landscape would have looked in the days the fort was in use. “Just the same”, he said. Maybe there was some hyperbole, but forest clearance happened early here and has not been reversed. There is something magical in walking in such a timeless landscape, along a track whose age is recorded in millennia, and at its best the western half of this National Trail gives some of the best walking, or should I say striding, in southern England. That said, there are longueurs too. Read on to find out more. Wednesday 26 April 2017. Goring to Sparsholt, 19 miles. It’s not a very Bronze Age start, through the modern villages of Goring and Streatley and along the main road heading north out of the latter. Even the turn-off puts you on to a minor road, but it’s climbing slightly, into an attractive dean on Thurle Down. At last the metalling ends, and a green lane takes you up into the open country around Roden Downs. Soon you encounter the first gallops. This is important horse-racing territory, the stables around Lambourn world-famous, and the important racecourse at Newbury away to the south: the training gallops will be a feature of almost all the remaining miles. Beyond the busy A34, the Ridgeway resumes its course above the scarp slope. Glance eastwards across the plain and the equivalent slope of the Chilterns is well in view. North, however, what was once open countryside is dotted with warehousing and industrial sites, including the former nuclear research site at Harwell. A little below the scarp in this area the map shows continuing stretches of Grim’s Ditch, encountered by the Ridgeway near Wallingford, on the stage before this one – though for me it would only be walked two weeks later. 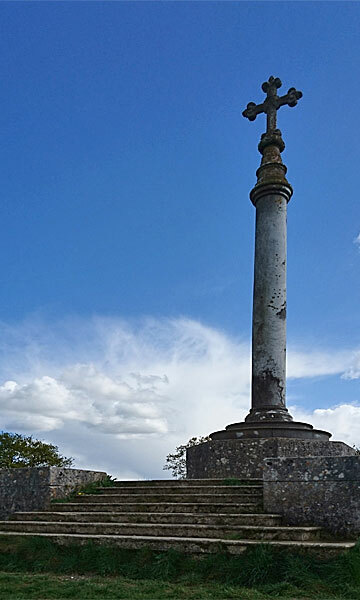 Overlooking the town of Wantage, the trail passes the Lindsay monument, a memorial to the first and only Lord Wantage, as Robert Loyd-Lindsay VC a hero of the Crimean War. The weather had been interesting – some sharp showers in view, but none on my bit of the Trail. I had originally planned to stay just off route at the Court Hill bunkhouse, but I was wise enough to check and it was full with a school party. In fact it was to make my logistics a bit easier. A couple of farms hereabouts run informal camp sites, and I’d checked that Hill Barn had space for me. It was just a case of pitching up in their back garden. It was an interesting place, home of National Hunt trainer Harry Whittington, though the campsite and B&B are run by his mum Jo. Thursday 27 April 2017. Sparsholt to Uffcott Down, 20 miles. In earlier planning, I’d decided that the Foxlynch bunkhouse at Ogbourne St George was perfectly placed to split the trail’s remaining miles. Alas I found that it had recently closed, so plan B was needed. With no official campsites, only one option (other than an expensive B&B) remained – a wild camp. In practice … most landowners do not object if a tent is pitched on the Trail for a night and disappears the next morning as long as no litter is left, no damage done, nor camp fires lit. Uffcott Down seemed to fit the bill, and was the day’s objective. There was one problem however: no water high up on the Downs. I therefore planned to divert anyway into Ogbourne St George, where I could eat at the pub and fill up with water (and beer), though alas it added a couple of miles to a long day. No thought of that as I set off in the morning, the hill fort of Uffington Castle the first stop. I found much of the three miles towards it a tad dull, as the Ridgeway, although very much the ancient trackway, took an undulating course away from the scarp and constrained by hedgerows. This was something of a feature of the stretch to Ogbourne and it does mar what might have been a fine few miles. No matter: there is much else of interest. The ditch-structures of Uffington Castle itself are well-preserved, and worth the diversion, though I didn’t drop down to inspect the white horse scratched into the chalk overlooking the vale northwards. 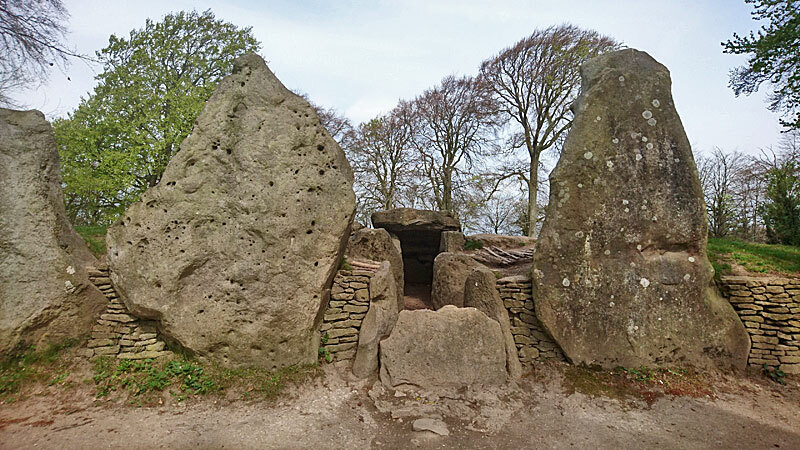 A little further along is Wayland’s Smithy, a neolithic chambered long barrow that bears two ancient burial sites. This is a prime area to sense the workings of ancient Britain. Lunch, with Mrs Whittington’s sandwich at the ready, was scheduled for Foxhill. The pub here would have been nice, but it’s now an Indian restaurant, so instead I sat in the village bus shelter. I never like doing this: it disappoints bus drivers if I don’t join them, and passing villagers might think I’m wimping out. But no buses and hardly any villagers would have noticed today. Out of here, there’s a bit of road walking and the M4 has to be crossed before things get much better – a marvellous open, airy section over Liddington Hill. I passed a group of girls on quasi-DoE training and was impressed that they were heading as far as Marlborough today. The good ground continued as the trail turned south, before taking a loop around Ogbourne St George. I had decided by now that I didn’t really want to divert into the village. My feet could handle it, but I would lose the purity of line, and I had made such good time that I was very early for the pub. If, I said to myself, there was a handy tap before my diversion point, then I would fill my two one-litre Sigg bottles from them and continue direct to the wild camp. And there, at the last cottage before the main A346 road – almost the last place that could have sufficed – was a tap. Bless you. The one downside was that it was only half-past 3, and the pub diversion would have eaten up a couple of hours. I decided to hang around a bit at the picnic area on Barbury Hill, though in truth I was glad of a rest, for the long mile before it on the slowly-rising Smeathe’s Ridge was a tough one, straight into a cold and freshening wind. The day’s early sunny promise had long since gone. 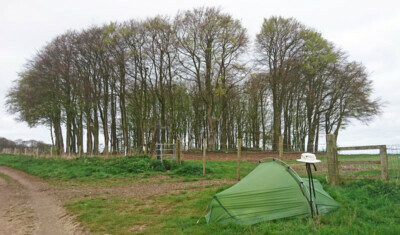 Uffcott Down, at a path junction beside a little spinney, was indeed just right for a solo wild camp. My one slight concern was the nearby gallops: what if I were woken at dawn by thundering hooves? No need to worry about that now. I pitched. I texted home. It squalled, and with the squall came an hour’s heavy rain. If I had been to the pub, I would have had to walk right through it. Friday 27 April 2017. Uffcott Down to Overton Hill, five miles (and on to Avenury, eight miles). The last few miles are uniformly glorious, arguably the best on the whole trail if not within all of southern England. Walking south, the scarp is never far away on your right, so the views stretch across the fertile valley of the upper Kennet. One or two little villages straggle across the river down below, the last of them Avebury – not, alas, the finish of the Trail, as the ancient Ridgeway never went there, but a centre of the prehistoric community that first brought this track into being. 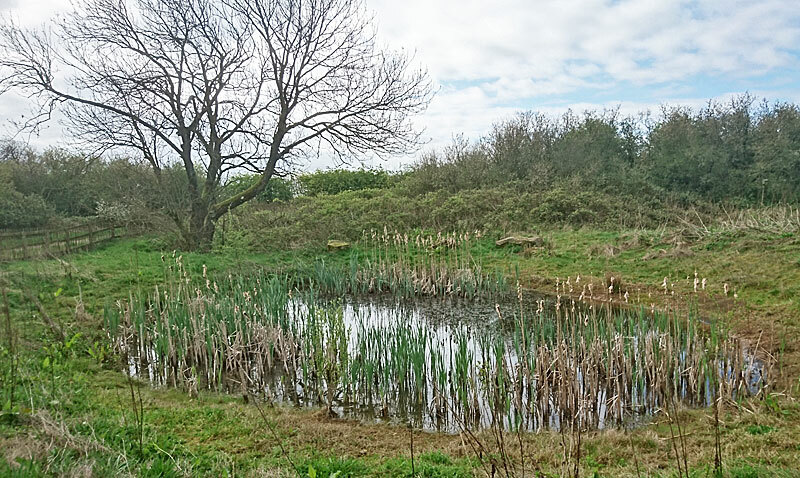 There’s one diversion away from the scarp, on Berwick Bassett Down, but it’s short and has its own interest in the form of a recently-restored dewpond. I knew about dewponds from the Sussex Downs, similar chalk hills. Water easily seeps through porous chalk so it’s difficult to maintain standing pools for livestock. 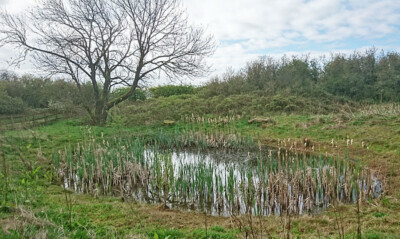 Dewpond technology, of clay-lined depressions carefully sited to attract water, dates back hundreds of years, and this particular dewpond had recently been carefully restored as an exemplar. Beyond the dewpond, sarsen stones left over from the ice age, known as the Grey Wethers, are scattered around Fyfield Down, looking like a flock of sheep lazily munching on the rich grass (indeed, hence the name: wether = gelded ram). Exploring these would have made a fascinating diversion in itself: one of the tyrannies of long-distance trails is that the mindset they encourage does not permit of variations, and I made none, and I doubt if I will pass this way again. You don’t have to make the same mistake. But for all the glory of this brief five miles – aided by a couple of chats with people just starting their Ridgeway experience – it ends with a crass anti-climax. The start is officially designated as ‘Overton Hill’. Look it up and you will find it lauded for the ancient barrows and stone circle on its slopes. But it’s barely a hill in the sense of ‘prominence’. It is a hill for car drivers on the A4, as they take a shorter route than the Kennet, which winds around its southern base. Geologically, it’s simply the end of the downs as they come to the river. To the walker, it’s an area of grubby hard standing where drivers can park up and stretch their legs. Drivers think it’s quiet; walkers think it’s noisy. A place to anticipate the start of a walk, perhaps, but not a place to celebrate ending one. You are not allowed to climb it, thank goodness – a few months before, I had been to Uluru (aka Ayer’s Rock) in Australia, and heard the heartbreaking tale of how tourist climbing had, in 35 years, rendered unpotable a drinking-hole at its base that had been used by the indigenous peoples for 35,000 years. But though regular in outline, perspectives of it change at every twist of the path. I enjoyed too an occasional comparative glance at the barrow-shaped Waden Hill, which interposes between Silbury Hill and the Ridgeway. Avebury is entered by a large tourist car park. 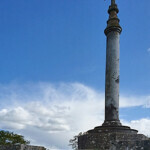 I don’t begrudge that; it’s not badly placed, and if I were a tourist, I would use it too. I didn’t though take the regular tourist path away, and soon found myself on a quiet pretty lane. Walk along it and people return at the village’s Neolithic stone circle, the largest in Wiltshire, in Britain, in Europe, on Earth, in the known universe. Now, that’s a place to end a walk.